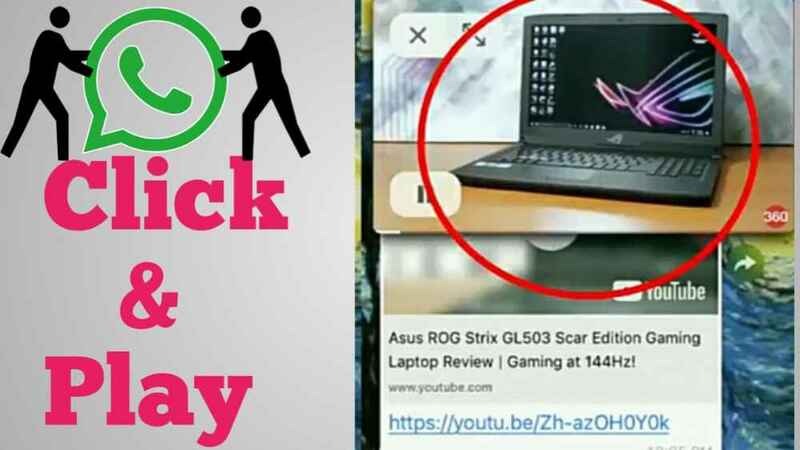 Whatsapp Click & Play Features In Hindi Play YouTube Video In Chat: whatsapp Ne Apna Ek New Dhamakedar Features Launch Kar Diya Lekin Ye new whatsapp Feature "Click & Play Button" Sirf IOS User's Ke Liye Available Hai. Android user's Ko iske Liye wait Karna Hoga. So Let's Know whatsapp Click & Play Feature Kya Hai? Is Feature Ko Kaise Enable Kare or whatsapp youtube Integration feature work Kaise Karta Hain. Here is full information in Hindi. Whatsapp ke is new features Click & Play se Aap YouTube Video Ko whatsapp me he Play Kar sakte Hai. Aapko Pata Hoga ki Jab Hum Koi YouTube Link Pe click Karte The to Video Hamare YouTube Application Me Opan Hota Tha. Lekin Ab YouTube Link Pe click Karte He Video whatsapp Chat window Me He Play Ho Jayega. Whatsapp Chat window Me He YouTube Video Small Bubbal Ki Tarrah Play Hogi. Aapko Video Me Play, Pause, Close, Full Screen Jaise Options Bhi Milege. Jise Bina YouTube Pe Gaye youtube video whatsapp Pe dekh Sakte. Is whatsapp Click & Play Feature ko Enable Karne ke Liye Agar Aap iPhone User he to App Store Se whatsapp Update Kare And Enjoy This New whatsapp Feature. Is whatsapp youtube Integration feature ko sirf IPhone user's ke Liye Available Hai Ho Sakta Hai Jaldi He Ye Feature Android Me Bhi Dekhne Ko Mile so Android User Must Waiting for This youtube Integration feature Who Are waiting for This whatsapp Feature Comment Below !! 0 Response to "Whatsapp Click & Play Features In Hindi Play YouTube Video In Chat"